Based in Hamburg, Germany, Sea Cloud Cruises operates luxurious and refined cruises on their two traditionally rigged sailing ships, Sea Cloud and Sea Cloud II. Catering to well-heeled, sophisticated American and German passengers, Sea Cloud's sailing ships travel to smaller, less touristy ports in Europe and the Caribbean. Founded in 1978, the company acquired the famed sailing ship Sea Cloud and began an extensive restoration to return the vessel to her original glory. For years, Sea Cloud Cruises operated only the one ship until economies of scale prompted them to grow the business. By 2001, the company was finally able to fulfil one of its longstanding goals by introducing a second traditionally rigged sailing ship with a slightly higher passenger capacity, Sea Cloud II. Building such a vessel in the modern age proved more difficult and costly than expected, and the Sea Cloud II was delivered almost a year late. Enjoying an enviable reputation as one of the finest small ship operators, much of their business comes from private charters to alumni or museum groups. Because of the high percentage of charters and the number of passengers who choose to sail with them through word of mouth, they are not well known in the mainstream American cruising public and have little need to rely on advertising. For many travellers, there is simply nothing better than spending a week on one of the Sea Cloud vessels. The experience is exclusive and decadent, and on the beautiful sailing vessels, passengers have the rare chance to sail on an authentic tall ship. No matter the ship you choose, however, you can expect the finest in cuisine and personal service in some of the most attractive vessels at sea. Life onboard either of the Sea Cloud vessels is refined and luxurious, with the best in service, appointments and cuisine to be expected. On their two sailing vessels, days often revolve around the outdoors as passengers marvel at the spectacle of the masts, shrouds and yardarms that support the sails. Afternoons at sea are spent chatting with like-minded passengers or simply reading a book outdoors. At night, dinner is often served on deck, and the onboard entertainment consists, at most, of a piano player, although complimentary wine during meals ensures a lively, jovial atmosphere. There are simply no such things as announcements, bingo or art auctions. This is an extremely comfortable, sophisticated experience, but one that does not become stuffy because of the outdoor atmosphere and friendly camaraderie amongst passengers. Sea Cloud's ships attract an upscale, erudite group of passenger interested in sailing, history, art and other cultural aspects of the line's itineraries, as well as warm-weather activities on Caribbean cruises. Most are professionals, many retired, and there are few children found onboard. Many will be sailors themselves, or own their own boats and yachts. Ages vary from 40's to 70's, with the average age usually in the 50's. The majority of passengers onboard Sea Cloud vessels are American, however, these are ships with multi-national passengers, and the tour operators are happy to speak in either English or German. As not only the company's flagship, but also one of the most famous ships in the world, the Sea Cloud is something of a living legend. Built in 1931 as a private yacht for Marjorie Merriweather Post, as the then largest private sailing yacht in the world, Sea Cloud is a true sailing ship with almost an acre of sails overhead. Her historic career and elegant trappings create an atmosphere that is thoroughly indulgent and privileged. 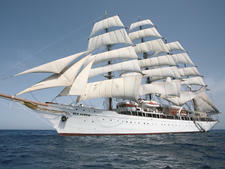 With its four masts and 29 sails, the 65-passenger Sea Cloud is one of the most beautiful ships at sea. Adorned in rich woodwork, constantly shined brass, and seemingly miles of coiled line, the ship manages to still feel like a yacht rather than a cruise ship. Her ten original cabins are all distinctive, with some offering decorative fireplaces and not just one, but two walk in wardrobes (there are more modern cabins as well). By combining many traditional elements with more modern amenities, the 94-passenger Sea Cloud II, built in 2001, managed to capture much of the magic of her older sister and was well worth the wait. Happily, the introduction of the second sailing vessel has allowed the company to offer more far ranging itineraries and appeal to those passengers who insist on conveniences such as a small fitness area or a fold out watersports platform. One of the highlights of these ships is the fact that they are both hand-steered, unlike many other cruise ship yachts. Sea Cloud and Sea Cloud II winter in the Caribbean, offering one week itineraries usually from Antigua or Barbados to some of the lesser known isles such as Jost Van Dyke or Isle des Saintes, Guadeloupe. For the vast majority of passengers, ample time under sail during the day is vital and so itineraries often have half-day port calls to allow for several hours a day underway. During the summer months, the two ships head over to Europe. Sea Cloud stays in the Eastern and Western Mediterranean, with superb itineraries that visit smaller, less well-known ports such as Korcula, Croatia or Olbia, Sardinia. Sea Cloud II wanders a bit more, spending time in the Mediterranean as well as exploring the west coast of Spain and Portugal, cruising around the British Isles and even going into the Baltic as far north as St Petersburg. In late November, the ships usually offer a long westbound Atlantic crossing. River Cloud I and II sail mostly on the Danube, Maine and Rhine rivers, and Belgian and Dutch waterways, with some longer sailings reaching as far east as the Black Sea. Cruises run April to November and are usually seven nights.